Let me just start with how much I LOVE this cover!!! I’ve read a few of J. Daniels books. 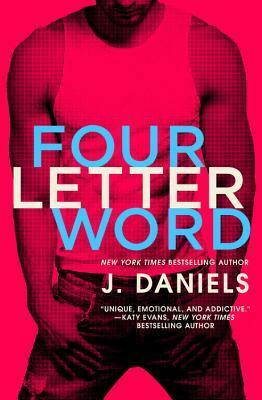 To this day the Sweet Addiction Series is still my favorite, it also happens to be the first books I read by J. They truly hold a special place in my heart. That being said Four Letter Word takes you on a journey of finding where you are meant to be in life, at the lowest point in your life to finding what you need when you least expect it. The Dirty Deeds Series is going to be amazing. J gives you strong, memorable and relatable character and some the feistiest and funniest supporting character, which will leave you wanting their books as soon as possible **cough cough Tori and Jamie’s book! Sydney and Brian’s relationship doesn’t start the traditional way. Unless you call dialing the wrong number and chewing out the wrong man for breaking your best friends heart, traditional. What starts as a wrong number, turns to a friendship, to a shoulder to lean on and eventually a real relationship. This is a perfect read for a lazy day at the beach or curled up in a blanket on the couch. Just make sure you have the day free of activities because once you start you won’t be able to stop! Thanks for review Terri! I can't wait to read this one, and I love the cover also!